In recent weeks, I’ve observed a troubling trend among America’s pundit class–the tendency to make really lazy Bernie Sanders/Donald Trump comparisons. You see, Sanders and Trump are both political outsiders, they both tell it the way they think it is, they both have experienced significant growth in their poll numbers in recent months, and they’re both causing problems for their parties’ other candidates. Revelatory, right? Pundit centrists love to draw strained equivalencies between the left and right in American politics and they love to focus on elections as narrative struggles between good guy centrists and bad guy extremists, so it’s natural for them to see these two figures as analogues. In truth, Sanders and Trump could not be more different–not merely in terms of their ideologies and policies, but in their whole approach, in their very attitude toward the public. Mr. Trump, it has not escaped anybody’s notice that you say that the Mexican government, the Mexican government is sending criminals — rapists, drug dealers, across the border. Governor Bush has called those remarks, quote, “extraordinarily ugly.” I’d like you — you’re right next to him — tell us — talk to him directly and say how you respond to that and — and you have repeatedly said that you have evidence that the Mexican government is doing this, but you have evidence you have refused or declined to share. Why not use this first Republican presidential debate to share your proof with the American people? So, if it weren’t for me, you wouldn’t even be talking about illegal immigration, Chris. You wouldn’t even be talking about it. This was not a subject that was on anybody’s mind until I brought it up at my announcement. And I said, Mexico is sending. Except the reporters, because they’re a very dishonest lot, generally speaking, in the world of politics, they didn’t cover my statement the way I said it. The fact is, since then, many killings,murders, crime, drugs pouring across the border, are money going out and the drugs coming in. And I said we need to build a wall, and it has to be built quickly. And I don’t mind having a big beautiful door in that wall so that people can come into this country legally. But we need, Jeb, to build a wall, we need to keep illegals out. Mr. Trump, I’ll give you 30 seconds — I’ll give you 30 seconds to answer my question, which was, what evidence do you have, specific evidence that the Mexican government is sending criminals across the border? Thirty seconds. Border Patrol, I was at the border last week. Border Patrol, people that I deal with, that I talk to, they say this is what’s happening. Because our leaders are stupid. Our politicians are stupid. And the Mexican government is much smarter, much sharper, much more cunning. And they send the bad ones over because they don’t want to pay for them. They don’t want to take care of them. Why should they when the stupid leaders of the United States will do it for them? And that’s what is happening whether you like it or not. Trump is not stupid–he realizes that there are a significant number of Americans who believe his claim regardless of the evidence and respect rudeness and insult politics as a form of resistance against political correctness. He makes these people happy by refusing to play by the rules, by always going on the offensive against anyone who criticizes his people or their worldviews. These people believe that Mexico is “killing us at the border” as an article of faith. They don’t need or want Trump to prove it. When Trump finally did release a policy paper on immigration, he continued asserting many of the same old positions without offering adequate evidence, promising extremely aggressive policies that would cost a lot of money and inflict immense suffering on many families. But aside from a few policy-focused blogs, most people have not really been discussing Trump’s policy positions. The discussion of Trump after the debate has centered around his attacks on moderator Megyn Kelly–attempts by Trump to score more style points with his supporters that have nothing at all whatsoever to do with policy. Despite the efforts of many pundits to use Trump’s comments to sink him, Trump’s core constituency continues to admire his bellicosity, and as of August 18, his quarter of the republican electorate continues to stand by him. Cox: Do you think it’s fair that Hillary’s hair gets a lot more scrutiny than yours does? Sanders: Hillary’s hair gets more scrutiny than my hair? Sanders: Is that what you’re asking? Sanders: O.K., Ana, I don’t mean to be rude here. I am running for president of the United States on serious issues, O.K.? Do you have serious questions? Sanders: When the media worries about what Hillary’s hair looks like or what my hair looks like, that’s a real problem. We have millions of people who are struggling to keep their heads above water, who want to know what candidates can do to improve their lives, and the media will very often spend more time worrying about hair than the fact that we’re the only major country on earth that doesn’t guarantee health care to all people. Cox: It’s also true that the media pays more attention to what female candidates look like than it does to what male candidates look like. Sanders: That may be. That may be, and it’s absolutely wrong. Buzzfeed has an entire article devoted to Bernie Sanders’ hair jokes. The Washington Post did a whole bit called “Great Moments in Bernie Sanders’ Hair“. The list goes on. So in point of fact, no, Hillary Clinton’s hair does not get more scrutiny than Bernie Sanders’ does. But why should we even have this argument? 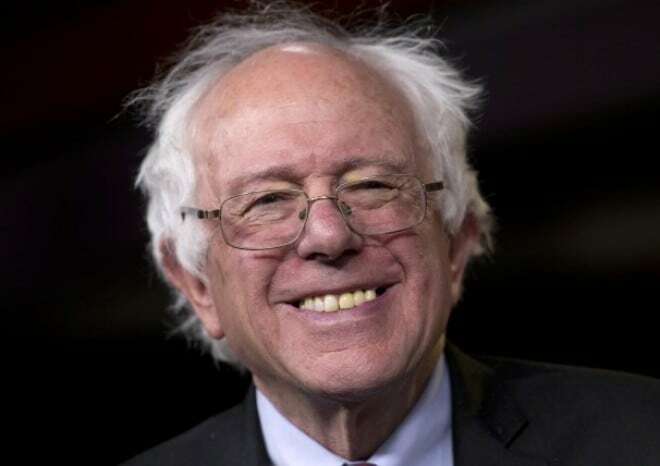 If Clinton’s hair did get more attention (as is generally the case when women run against men), what exactly would we expect Bernie Sanders to do about that? What policies should the government enact to make the media treat men and women more equally? Most would agree that while the disparity is unfortunate, any kind of substantive policy aimed at targeting this would unacceptably infringe upon press freedom. So what did Cox want from Sanders? Odds are, she wanted him to say something sympathetic about gender inequality, to show that his style of rhetoric matches up with what she wants to hear. I have no doubt that his refusal to throw her that bone will be read by some feminists as a show of opposition or indifference to gender equality. These people will ignore Sanders’ policy record and accuse him of trying to “silence” Cox’s female voice. They will fail to see what’s really going on–this is a candidate who cares deeply about the concrete suffering that government policy can directly influence. He is trying to get people to talk about those issues and the policies that could address them, and instead they keep talking about his identity as a socialist white man, his rhetorical style, and the way he presents himself. And this brings us to the crux of the difference between Trump and Sanders. Both Trump and Sanders see the direction our politics is going–increasingly, no one pays attention to policy at all. What voters are really looking for is a candidate who presents him or herself convincingly as someone who cares about people like them, who talks the right way about the right stuff. If Clinton can present herself better than Sanders on race or gender equality, it doesn’t matter that Sanders has better policies and a more robust record of doing things about race and gender. If Trump can present himself as more of an ordinary person, as more hostile and bellicose than Bush or Rubio or whoever, it doesn’t matter that his policies are poorly evidenced and don’t make sense and that in reality Trump is a billionaire who has nothing at all in common with ordinary folks. Trump embraces this trend in our politics–he takes full advantage of it and in the process, he does us the service of exposing it for all to see. Sanders resists this trend–he keeps trying to get people to have the serious policy debates we perhaps once had in decades past. Sanders knows that outrage and invective get more attention than good policy. He has the optimism to try anyway–to think that maybe, if people hear his message, they’ll support him. Despite all the evidence to the contrary, Sanders still believes in people. Trump is the ultimate cynic. That’s the difference. They get more clicks when they themselves talk about style rather than substance, so they’re happy to continue reinforcing the trend. Pundits are not policy experts–they’re ineffective at evaluating policy and consequently they prefer not to talk about it. Pundit centrism–these guys are legitimately pulling for some establishment candidate. They believe–wrongly–that some establishment candidate can magically bridge the gap between the parties and work across the aisle, when the reality is that polarization has steadily increased for years despite the parties’ continual embrace of “centrist” or “establishment” presidential candidates. So the steady decline in our discourse marches on. Thank you, Benjamin, for yet again stating in careful detail the obvious, which shouldn’t have to be said at all — a criticism, not of you, but of the boobocracy. Can we repost this one on our website as well? Sure, with the same citation as before. Glad you liked it! Thank you, sir! Your writing educates me every time. I don’t see any reference to Trump’s actual Immigration and Domestic Jobs Policy that was released before this article was written. I assume that was just an oversight or you were not aware. In any case, here it is..
My take on Trump is that he is holding his policy cards as close to his chest for as long as he can…drip…drip…drip. The longer he does, the more attention he gets and the less scrutiny he will need to endure from those that disagree (RINOS and Liberals). Sorry, I apologize, I see that you do eventually link to the policy. That being said it is certainly not a retread of his vague statements he made earlier. He has very specific details. I am not saying you or I should agree with him or each other, but the details are clear and concise. These are views we can actually debate. Naaaaw, the real problem is that people would even bother to compare Trump to Sanders in the first place. They are not the “extreme” ends or the polar “opposites” of a country and you should not even allow Trump into a discussion with the likes of Bernie. By confusing Trump as anyone someone with validity in governance you are in fact causing the perpetuation of the problem. Your political take is rather limited being not from America. Your outsider view needs much assistance. lemme know if you need real insight and not just your personal feelings on the matter. I am an American. Trump is leading the polls and that means he should be subjected to policy scrutiny, the same as any other candidate with a significant polling presence. oh I’m sorry for misunderstanding! You actually seemed british, no offense. Wonder if you think it’s any more substantive than the others? The funny thing is, there actually is a famous guy named Bernie with whom Donald Trump does have an awful lot in common… but his last name isn’t Sanders. It’s Madoff. Since you brought up the ridiculous reporting in the NYT about hair (of course there is a difference since they are of different gender and older than average), I wondered about the article in the NYT concerning Tribune Publishing (LA Times, Chicago Tribune). Seems like so many other major papers circulation has plummeted. Tribune has $350 million in debt and a cash reserve of only $40 million. They were rescued past year by cross town rival, Chicago Sun Times. So much for the future survival of print journalism and maybe someday broadcast journalism as well.